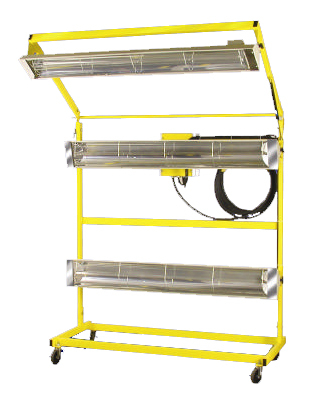 Infrared curing lamps are a cost effective way to speed up the process of drying or curing most air-dry coatings. Infrared curing technology has been used by auto body repair professionals for a long time. The vast majority of infrared curing lamps are using short-wave infrared lamps to speed up the drying process of putties, fillers, primers, base coats and clear coats. Why do auto body repair professionals use infrared lights? Infrared’s main focuses is exceptional speed, high efficiency, precision control and zero emissions. Infrared heat dries one-quarter to one-tenth the time needed when air-drying finishes. It also requires little to no air-flow reducing the possibility of dust or debris contaminating the finish. The heat is more cost efficient than convection heat since it reduces cycle times, transfers heat directly to your product and doesn’t require an expensive enclosure like an oven to keep and recirculate the heat. These heat lamps generate zero emissions and will not pollute the air. So…plug in your lamp and speed up your work times! If you paint and cure full vehicles often, you should consider the benefits of a paint booth.